Powers/Abilities: As the Everyman, Ekler wielded a foil which could fire blasts of energy, a shield, and the Absorbascann. As the Zeitgeist, he wielded a camera which could take pictures of people's deaths before they occurred, and a belt which could allow him to change appearances, and become invisible. History: (Marvel Team-Up I#132 (fb) - BTS) - Reed Richards, an old friend of Milton Ekler, was present when Larry was born. Larry grew up refering to him affectionately as Uncle Reed. (Captain America I#267 (fb))- Larry Ekler was the son of a hard-working lower-class man who never stopped believing in the American dream, no matter how bleak his life was. When he died penniless, without even enough money to pay for his funeral, Larry became determined to lead a revolution that would make people realize that the American dream was a falsehood, kept alive only to keep people in line, and to exemplify the struggles of the common man. (Captain America I#267)- After designing for himself the identity of the Everyman, Ekler became the leader of a gang of young people, including Maggie, who believed in his ideals. One of his followers, Ira, attempted to assassinate Captain America in public, only to fail. The Everyman promised his other followers that Captain America would die. 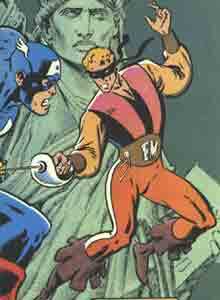 To make his debut, the Everyman contacted the media and had them issue his statement to Captain America-- to meet him at the Statue of Liberty for a duel, or that people would die. To prove his point, he shot two policemen dead on tv. Captain America met the Everyman at the Statue of Liberty, but his shield proved no match for the Captain's indestructible shield, breaking on the first blow. He managed to singe Captain America with one of his foil's blasts and turned to the onlookers in triumph, only to find that Captain America was not down, and struck the Everyman. Desperate, the Everyman took Maggie as a hostage, and explained to Captain America how he would become someone people would remember; as an example, he spat upon Captain America's chest, declaring that that footage would make the news across the globe. Cap asked him to let Maggie go, but the Everyman replied that he would kill her anyway-- just because. Captain America was finally able to overcome the Everyman by playing off his pride, suggesting that he was superior to him. Outraged, the Everyman raised his arms in protest-- and Cap knocked his foil from his hand and clubbed him in the head with one fell swoop. The Everyman was taken into custody by the police, eager to take a cop-killer off the streets. (Marvel Team-Up I#132 (fb) - BTS / (Marvel Team-Up I#133 (fb) - BTS) - After learning of Milton's death and Larry's insanity, Reed Richards took responsibility for Larry, and paid for his care at what he believed to be the world's finest psychiatric institutes: the Fenhoff Institute. However, that facility was under the control of Dr. Faustus, who used his psychology skills to manipulate Ekler to his own ends. Arming Ekler with his Absorbascann, Dr. Faustus sent him to assault Reed Richards as part of a plot to drive Richards mad. (Marvel Team-Up I#132)- Larry arrived at the Baxter Building, pretending to have been declared sane and released from the Institute. Realizing Larry was definitely not sane, Reed was nonetheless unprepared when he returned to find Larry wearing a featureless mask. Larry physically battered Reed and then used the Absorbascann to neutralize his superhuman intellect. Spider-Man found the injured Reed and helped him track down Everyman, who was standing outside the 42nd Street Library and using the Absorbascann to drain energy from those around him to make him powerful enough to fight off the police. He continued to use the device to defeat Spider-Man and Mr. Fantastic, but Spidey was able to force him to see that the Absorbascann was not making him one with the common man. Rather than uniting them, it was draining the life of the people within range, killing them. Under Spidey's advice, Ekler fled, and once he was far enough away, everyone began to revive. (Captain America I#442 (text page))- Ekler wound up under Dr. Faustus' care again, and Faustus used his contacts within the Secret Empire to supply Ekler with the technology to create the identity of Zeitgeist. Dr. Faustus sent Ekler out as the Zeitgeist to assassinate super-villains. (Alpha Flight I#78)- Zeitgeist tracked down the South American super-hero Captain Forza and killed him. This was sensed at the time by Dr. Strange. (Captain America I#387/2 (fb, BTS))- Zeitgeist became a member of the Schutz Heiligruppe to use as a cover identity. With the team, he helped destroy Arnim Zola's clones of the Red Skull kept at Zola's castle in Switzerland. (Captain America I#388/2 (BTS))- Zeitgeist helped his teammate Hauptmann Deutschland capture the Red Skull by teleporting both of them to their craft. (Captain America I#390/2)- When the Skeleton Crew came to rescue the Red Skull, Zeitgeist helped defeat them, using his power to strike down Machinesmith without him being aware of his presence. (Captain America I#393)- When Machinesmith broke himself and the rest of the Skeleton Crew free, the Schutz Heiligruppe prepared to battle them, but were tricked by bioplastoids sent by Zola disguised as Thor, Iron Man and Captain America into allowing them to take the Skeleton Crew into their custody. (Captain America I#442 (fb) - BTS)- Zeitgeist continued his serial killings in South America, slaying Defensor, La Bandera, Machete, El Condor, Ojo Macabra, and Zona Rosa. This brought the Schutz Heiligruppe themselves to Beunos Aires to investigate. (Captain America I#442)- When Blitzkrieger investigated the killings, Zeitgeist confronted him, and presented him with a photograph of his own death. He then slew Blitzkrieger with the foil he had used as the Everyman. Next, as the Everyman, he slew the brother of the original Angel, now a homeless bum in New York. He declared that as the Angel was the first costumed hero, he would be the first to die. Zeitgeist led Vormund to the home of the original Angel, Thomas Halloway, head of Scourge Inc., having convinced Vormund that Halloway was behind the murders. Zeitgeist appeared to the elderly super-heroes gathered there as Vormund to set them against him, and then set after Captain America to kill him. However, Captain America's armor protected him, and he shrunk Zeitgeist foil using Pym Particles. Captain America tracked Zeitgeist down using the enhanced vision supplied by his armor, and Zeitgeist fled-- right into the arms of Vormund. Vormund redirected the thrust of Zeitgeist's sword back at him, stabbing him through the heart. Comments: Created by J.M. DeMatteis, Mike Zeck and John Beatty. The Everyman's father was named Milton in Marvel Team-Up I#132 and Josh in #133, so Milton Josh Ekler is presumably his true name. Machete somehow survived his off-panel death at the hands of Zeitgeist only to die on-panel in U.S. Agent II#1. Zeitgeist made a mistake when he stated that the Angel was the first costumed hero. Diagetically, Phantom Rider, the Freedom's Five, Night Raven, et al. would have preceded him. You're correct, but he was the first hero published by Marvel Comics--I think. I ASSume it was a(n) homage to that. Zeitgeist has an entry in OHotMU 2006 A-Z#12.